55th Lifestyle Store in the country reveals new store format for the brand. Part of Dubai based retail to hospitality conglomerate - The Landmark Group, Lifestyle brings multiple concepts including men, women, kid apparel; Footwear, Handbags, fashion accessories and beauty under the convenience of a single roof in each of its store. Lifestyle, India’s leading chain of fashion stores, has unveiled its new format Lifestyle store today at Phoenix Marketcity, Whitefield, Bangalore. 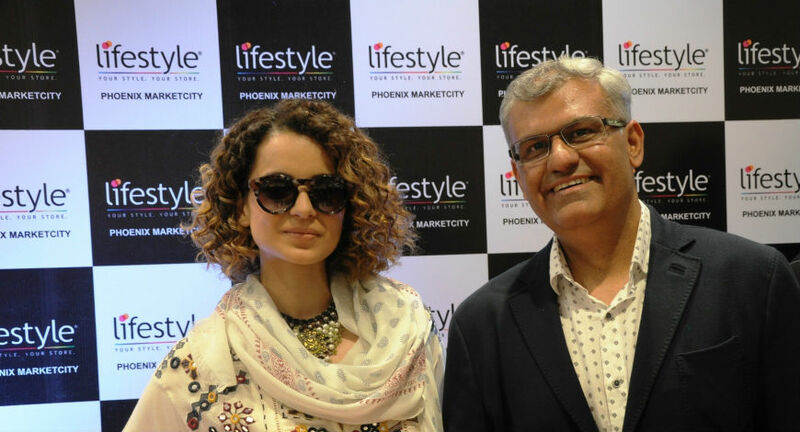 Renowned actress and brand ambassador for Melange by Lifestyle, Kangana Ranaut inaugurated the store along with Mr Kabir Lumba, Mananging Director, Lifestyle International (P) Ltd. The new format store is spread across three floors and 45,000 sq. ft. and creates a seamless shopping environment, elegantly framing the trendy and fashionable offering that Lifestyle is renowned for. The design philosophy aims to provide an uninterrupted line-of-sight that allows customers to view the whole offering on the floor in a single glance. Focal points are planned at vantage points to draw customer attention and guide their flow in the store. The store elevates shopping convenience through even better merchandise display, digital screens and trend highlights. Every element in the new format has been curated to make the Lifestyle shopping experience truly world class. Part of Dubai based Retail to hospitality conglomerate, Landmark Group, Lifestyle is renowned for offering customers the right blend of national and international brands in a lively and vibrant shopping environment at accessible prices. Bringing under one roof – Apparel, Footwear& Bags, Children’s wear, and Beauty & Accessories, Lifestyle is the absolute one stop fashion destination. Customers can choose from hundreds of leading national and international brands including Louis Philippe, Vero Moda, Only, Van Heusen, Arrow, Code, US Polo, Allen Solly, Levis, Kappa, Bossini, UCLA, Melange, Juniors, Catwalk and many more. Lifestyle Stores are present across leading Indian cities including Agra, Ahmedabad, Amritsar, Bangalore, Bhopal, Chandigarh, Chennai, Calicut, Coimbatore, Delhi, Dehradun, Ghaziabad, Gurgaon, Hyderabad, Jaipur, Jalandhar, Jammu, Kanpur, Kalyan, Kolkata, Kochi, Lucknow, Ludhiana, Mangalore, Mohali, Mumbai, Noida, Nagpur, Pune, Surat, Thane, Thrissur, Trichy and Vijaywada and Indore.